Make the pecan praliné: lightly brush a baking sheet with vegetable oil. In a medium-sized heavy saucepan, combine the sugar and water and cook over medium heat, stirring constantly, until the sugar dissolves. Increase the heat to high and bring the syrup to a boil. Cook without stirring, occasionally brushing down the sides of the pan with a wet pastry brush, until the syrup turns a dark caramel. Immediately add the pecans and stir to coat with the caramel. Quickly turn the mixture out onto the oiled baking sheet. Cool for 20 minutes, or until hardened. Transfer the praliné to a cutting board and, using a large knife, finely chop it. Set aside. In the bowl of an electric mixer, using the paddle attachment, beat the flour, sugar, baking powder, cinnamon and salt on low speed until combined. In a large glass-measuring cup, gently whisk together the olive oil, eggs, yolk and orange zest. Add this mixture all at once to the dry ingredients and mix, still on low speed, just until combined; do not over-mix. Add the chopped pecan praliné and mix for a few seconds, until blended. Scrape the dough out onto a floured work surface and divide it into thirds. Shape each portion into a 30cm (12inch) long log. Transfer the logs to one of the prepared baking sheets, spacing them about 7.5cm (3in) apart (the logs will spread). With the heel of your hand, flatten the logs slightly, until they are about 5cm (2in) wide. Place the baking sheet on the upper oven rack and bake for about 25 minutes, or until the dough is set. Set the baking sheet on a wire rack and cool for 10-15 minutes. Reduce the oven temperature to 160°C/325°F. Slide a pancake turner under each log to loosen it from the parchment paper. Carefully transfer the logs to a cutting surface. Line the baking sheet with clean parchment paper. Using a serrated knife, cut the logs on the diagonal into 1.25cm (½in) slices. Arrange the slices cut side down and 2.5cm (1in) apart on the two baking sheets and bake for about 15 minutes, or until dry and crisp. Transfer the biscotti to a wire rack and cool completely. Thanks for this recipe!!! Biscotti is the only thing I attempt to bake. I love the addition of the pecan praline to the biscotti. Brilliant! these look so flavorful. 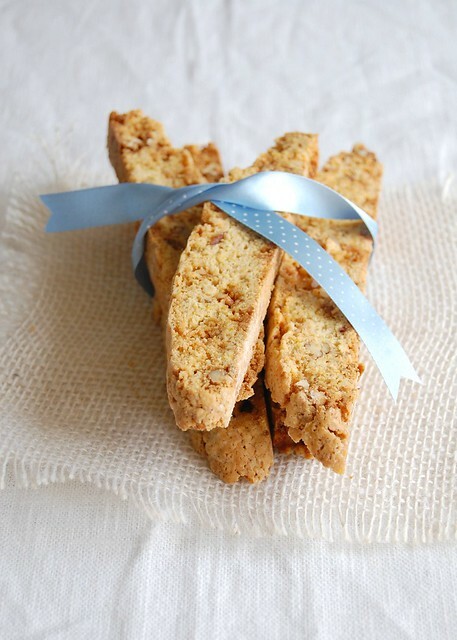 Wat a prefectly baked biscotti, looks absolutely stunning and incredible.. The only "Oscar" movie I've seen is The Help, and while I don't think the MOVIE is best-picture worthy I'm definitely pulling for Viola Davis! I adore pecans. And biscotti. Wonderful for breakfast with a mug of hot coffee!